It’s widely known that among developed nations, the U.S. struggles to keep up with its peers on paid family leave policies. This is a shame but there’s a bigger issue we need to address. That issue is finding everyone the good affordable childcare we all dream about finding for our kids. If we’re going to delegate our childcare to someone we want our children to learn something, be fed well, and their health and well-being made a priority. Unfortunately, there’s a good chunk of us in the US who either can’t afford this kind of care or who are barely making ends meet putting a third of our salary toward child care. But there’s hope! Affordable good quality child care is becoming a hot issue. People like Ivanka Trump are advocating for it and college professors are studying it. Here’s what they have found out and how good child care could positively affect us all. If the U.S. instituted affordable child care, child poverty would decrease. 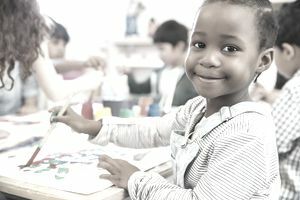 If children experience a good quality education, starting from birth, the U.S. would “achieve greater economic and social gains” according to a new study led by Professor James H. Heckman titled, “The Lifestyle Benefits of an Influential Early Childhood Program”. In Professor Heckman’s research boys and girls, who came from disadvantaged families, enrolled in the study’s free, good quality child care program. From infancy to the age of eight they studied the children’s educational advancement, emotional intelligence, home life, family atmosphere, and the family’s finances. Then at 12, 15, 21, and 30, their education, finances, and emotional well-being continued to be monitored. At 35 the study reached out one last time to perform a medical survey and a criminal background check. Professor Heckman discovered that for “every dollar spent on high-quality, birth-to-five programs for disadvantaged children delivers a 13% per year return on investment.” What this means is that if the U.S. government-funded this program the future monetary payoff would be big. There were other payoffs discovered, too. The children in the study were healthier and led a good life! They were better educated, employed and brought home a higher salary. These children were less likely to be involved in criminal acts because they are good people in our society. Last, but not least, the children’s mothers were able to earn a bigger paycheck because their kids were in this program. So how does this affect the rest of us? The pay gap would close up pretty quick if working moms were able to work better. With affordable good quality, child care moms would stress less about the well-being of their child and the cost associated with that. With capable competent child care, women may not suffer from mommy tracking or “the motherhood penalty”. This means motherhood wouldn’t count against them during their hiring process. How people view moms would change. They'd be seen as competent and committed to their work. Bloomberg.com recently published an article about how US economists should be concerned about working moms. Child care is a big barrier for working families face. If there were affordable childcare fewer women would leave the workforce and continue contributing to the growth of the U.S. economy. Paid leave and work flexibility would help, too, but good childcare would be the icing on the cake. We all wish we could all get along. In good quality child care, they learn to get along well with their peers. Imagine what the world be like if we didn’t have to worry about bullying! Without good quality care, kids may lack the understanding to deal with conflict and thus act out. We all wish we could all get along. In good quality child care programs they learn how to get along well with their peers. From the study, we learned those who received affordable good quality care develop into better well-mannered children. When they grow up they have a better chance of treating their wives or husbands better and perhaps decrease domestic violence. Then their kids would be better off. There could be less drug abuse! People use drugs to escape their problems. With affordable child care, parents would be able to work harder, earn more money, and provide a better upbringing for their child. Their reality wouldn’t be one they’d want to run away from! This would benefit all children because there may be fewer drug dealers on the block. Fast forward 30 years after affordable good quality child care is implemented. More competent educated workers would be in the office. These good-mannered crime-free individuals would be easier to work with, motivate, and promote. Office drama could become something of the past. These well-supported adults will have higher emotional intelligence that won’t waste their time and energy with office politics. At a young age, these adults learned how to get along with others. They grew up outside of poverty. Instead of gossiping and jealousy, these adults would focus more on teamwork and success. Professor Heckman's study teaches us that a better future starts with helping those less fortunate than us. There’s data that proves it. There’d be a trickle effect everyone would experience if the U.S. decides to invest in our children’s care. Wow. Imagine that.